The Buffalo Sabres played a better first two periods on Monday than they did on Saturday, and they played a better third period on Monday than they did on Saturday. Even so, Monday’s game didn’t provide any more help in the standings for the Sabres than Saturday’s game did. 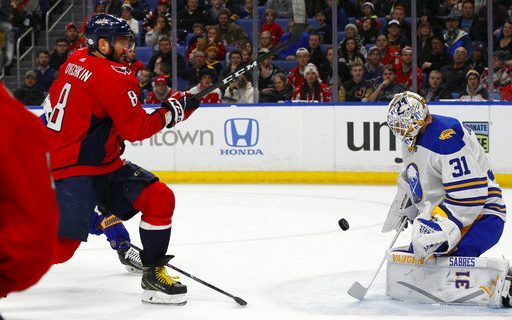 The Sabres dropped their third straight game on Monday afternoon, a 3-2 decision to the Washington Capitals before 18,228 in the KeyBank Center. The game represented a small step forward for Buffalo, although that had to be expected – heck, demanded – after trying to follow up on a performance that was by any definition substandard. For a period, both teams were rather well matched as they went through a scoreless 20 minutes. But it was Washington that turned up its level of play in the second period and took control of the game with a pair of goals. The first was by Alexander Ovechkin, who has been doing that for more than a decade. He dropped his stick down to a legal level above the ice and deflected a shot past goalie Chad Johnson. Goal-scorers do that, and Ovechkin is one of the best. About 12 minutes later, the Caps not only scored an insurance goal but they taught almost everyone in the building a rules lesson. John Carlson directed a puck that slid along the goal line, but waved off as no goal by a referee. Play continued for several seconds, stopping on a penalty call against Washington’s Evgeny Kuznetsov. The call was reviewed and overturned, as Carlson was given credit for the goal. The clock was wound back to where it was when the goal was scored, thus achieving mankind’s formerly impossible goal of turning back time to correct our mistakes. If only we could do that in other ways. The penalty still held up – forcing media types to sprint to a rulebook – but the Sabres couldn’t capitalize with the ensuing man advantage. Thus trailing by 2-0 with a period to go, the Sabres chose not to go gently into the late afternoon. They came out and dominated the third period, as the Caps played like they just wanted to finish up and get ready for a game on Tuesday with Tampa Bay. Okposo got one goal back on a deflection of a Scott Wilson shot. But in the final minute with the goaltender pulled, Rasmus Ristolainen starred in a comedy of errors that resulted in an ugly turnover and an empty-net goal by Kuznetsov. A score by Evander Kane – who looked more involved this time that he had in quite a while – with three seconds left only narrowed the final score. “We did some forechecking, and our defense was slamming, so we ended up with some good looks,” Okposo said about his team’s finish. Even so, it was just another one-goal loss for Buffalo. That’s eight this calendar year against two wins, which tells you something about the way the season has gone. Buffalo will try to do better in Detroit on Thursday and in Washington on Friday.